1. First of all,open your Notepad and paste the following code in it. 4. After downloading, copy the Install.inf file and paste it to the folder where all cursors are located. 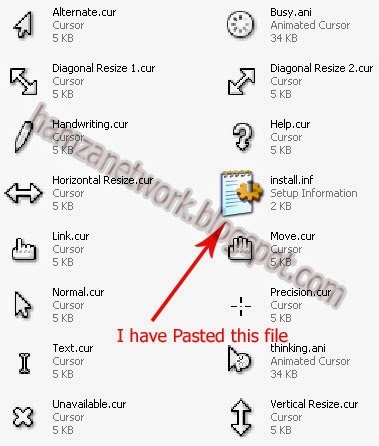 For example, when you will download the Linux Cursor Package then you see that all cursors are located in Zip folder. So first Extract this Zip Folder and then paste the Install.inf file in your Cursor Folder. I have pasted the Install.inf in Cursors folder. 5. After pasting, open your Install.inf file and Replace all Cursor names inside Inverted Commas according to the names of Cursors which are present in Folder. For example, you will have to write the name inside Inverted Commas which is the name of your desired Cursor. I have coloured the names of curosrs inside inverted commas in above code. You can also change the scheme name by changing Blue Color Code Inside Inverted Commas. 6. After changing all of your names, save your Install.inf file. After saving, Right Click on your Intsall.inf file and Click on Install. 7. When you will click on Install, your Cursor Scheme will automatically install and you can use your cursor scheme by going to Control Panel-----> Mouse------>Pointers------->Scheme-------->Linux Cursors. 8. I have tried my best to explain each & everything to you. If you still have any hesistation about above topic the you can freely ask.